One of the most anticipated games of 2018, Red Dead Redemption 2 by Rockstar was looking to expand and innovate on its open world even further. After so much hype, does the game live up to expectations? 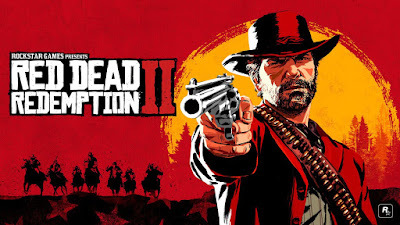 Following up 2010's Red Dead Redemption, Rockstar opted to go down the prequel route this time in order to flesh out the history behind the game. In the first game, you find John Marston hunting down old gang members and now in Red Dead Redemption 2, you encounter the events that lead up to this. In Red Dead Redemption 2, we play as Arthur Morgan in the Van Der Linde gang, who I felt had the most compelling performance ever seen in a video game. 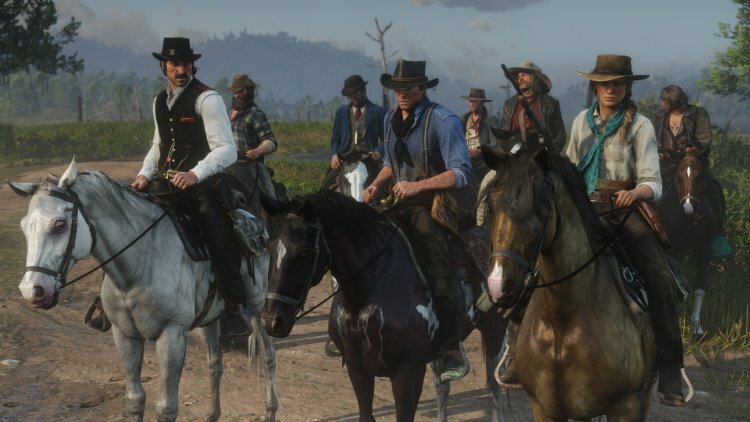 It was an absolute joy watching Arthur go from sticking behind the beliefs of gang leader Dutch, to eventually questioning every action. This narrative is intertwined into the majority of things you'll come across and it was great to see how their interactions changed as the game went on. The Red Dead Redemption 2 story is quite long and in some instances I felt that it could have been shortened down and still be as effective as it was. There are quite a few call backs to the first game, some obvious and some that only the keen eye will see. It is definitely a tragic tale and one that enacts the never ending cycle of the outlaw life, but what really makes this special is an engaging protagonist with incredible characters to bounce off of. 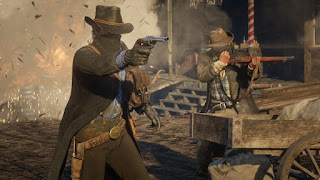 The game is split into chapters comprising of a certain number of missions, ranging from a bank robbery to shooting a supposed monster in a swamp; shooting from a hot air balloon or hunting down animals. In this instance you can never fault the game for not having quite the variety in its missions and outside of this, the world itself is huge and full of activities to do. 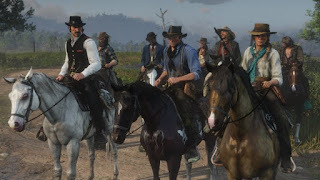 These activities can range from helping random strangers on your travels racing on your horse, gamble and more; the latter of which there is an actual mission for in the game. 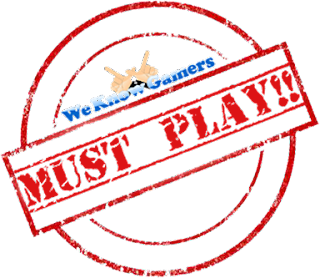 The most interesting ones are those that have a question mark on the map and these are not just a one and done, but actually require you to go back to multiple times, giving a much more fulfilling and engaging quest. I will now say that Rockstar have managed to create the best open world seen in video games. It just felt so natural and so impactful. The many NPC's you'll come across feel like they have their own personality and you can invest in every single one of them. Of course depending on how you conduct yourself, people will react differently to you and even Arthur's lines are changed slightly. Want to stay good? Help as many people as you can. Want to be pure evil? Well... there are multiple ways to go about that one. There will definitely be missions that require you to be on the wrong side of the law and this is where you get your bounty, now I've not had much of an issue when a bounty is low, however it can become really problematic, especially if you need to enter a busy area, let alone the bounty hunters that will be on your tail. Luckily there is an easy way to clear this and that is by visiting the local post office to pay it off. Now you may be thinking, "my hard earned money". Don't worry as you will have plenty of chances to build your fortune. Usually when a crime of any sort takes place, there will be a witness who will run off and go report it. If you are able to catch this person, you will avoid word of your notoriety getting out. This includes taking the person down or giving them a good old threat to keep their mouth shut. My most enjoyable interactions in the game would have to be the ambushes as they can happen at complete random. Imagine you are taking a peaceful ride down a road and you find a carriage blocks your path all of a sudden. Next thing you know, you are completely surrounded and being threatened with death. It just shows that everything you do has some consequence and in this instance, I just messed with the wrong gang. Your camp is essentially your home base where you can interact with the rest of the gang. Arthur uses stamina in order to get his jobs done and sometimes a quick rest here will put him back in fighting shape. You can also grab some food, interact with other members who sometimes will speak with you about current events and organise yourself in terms of weapons and ammo. Hunting is not an essential aspect of the game, however any wild animals you catch, you can bring back here to be shared with the crew or sell for money in town. One thing I found odd that was missing was fast travel, especially with a map so big that even traversing via horse can take some time, although the cinematic shots are quite breathtaking. It is only when I decided to upgrade the camp that I found it was one of the options available, so I definitely recommend doing this as I was already a good amount into the game before the realisation came to me. I'll admit that I never played the first game and now that I've experienced the amazing visuals, engaging world and characters,it may be a difficult task to look at Red Dead Redemption, especially as it was released back in 2010. 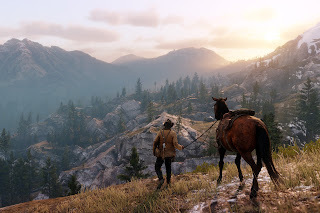 Rockstar have created an incredible world with Red Dead Redemption 2 and even after going through the story, there is still so much to do that it will keep you going for a long time to come and that is not even mentioning the online portion. 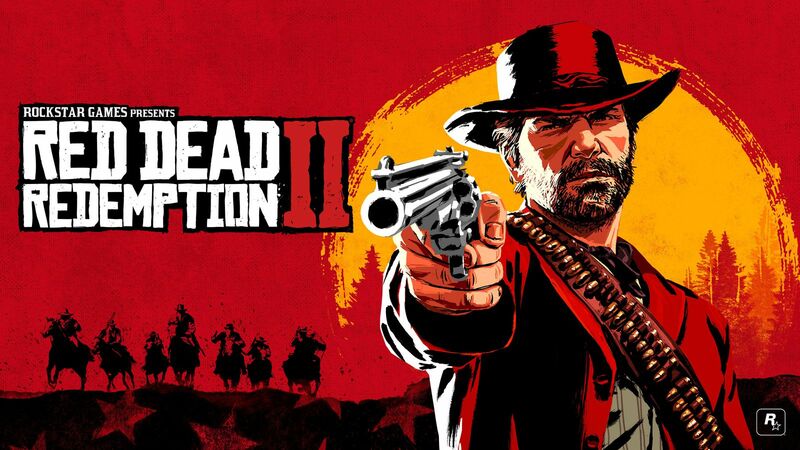 I'm incredibly intrigued to see where they go from here and whether they decide to go further back in time or set the next game after the first, but one thing is for sure, Red Dead Redemption 2 is not only the best open world game ever made but also one of the defining games of this generation.